Silverstripe 3 has been out for a few months now, and most the big bugs have been fixed… This tutorial describes the code required to set up a grid feild to manage ‘Has Many’ relations. Eg – a staff page that lists many staff members. Also, we’ll add in some code that will make the table list in the CMS display a wee thumbnail of each staff member – making it much easier for CMS users to manage the content. In the code above, we simple create a DataObject, and define two feilds, a name, and a details. At this stage, upload the files, run a dev/build and create a ‘staffPage’ in your CMS. 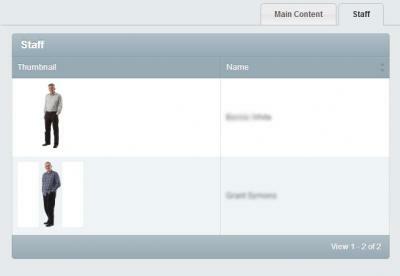 You should be able to see a datagrid and start adding staff members and photos. However, the grid field will probably just list your items by their ID – which is a bit meaningless. By adding the code above into the StaffMember.php file, we can define the fields (summary_fields) that are shown on the summary table in the CMS. The function getThumbnail takes the attached Image, and creates a thumbnail to use in the summary fields.